High impact polystyrene with extra wide cash trays, our cash tray can accommodate foreign currency. With spring-loaded bill weights to keep currency secure, the round-bottom coin trays allow for easy scooping. 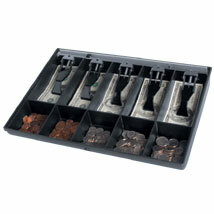 Cash Trays are the perfect replacement trays for most cash drawers found in retail stores, banks, and currency exchanges.